THERE WAS A STORY from one of the Gulf Wars about a reporter asking Western troops why they thought they were there. As yet another Western intervention/invasion in the Middle East gathers pace, why is the commentariat apparently oblivious to the role of oil? Oil has driven a century of meddling by Western countries ‒ meddling that has fed generations of resentment and radicalisation ‒ and you can be sure oil is behind the current interest of the U.S. in the Islamic State (I.S.). The U.S. talks democracy, but doesn’t hesitate to cuddle up to brutal tyrants, nor to overthrow elected governments. The CIA’s very first postwar adventure was to orchestrate, in cooperation with the British, the overthrow of the elected Mossadegh Government of Iran in 1953. Mossadegh’s crime was to take control of his nation’s oil industry from an exploitative British company. He was removed and the compliant Shah of Iran was installed. The Shah ruled as an absolute monarch, and his repression and the introduction of Western culture fed the rise of the Islamic fundamentalists who eventually overthrew him in 1979, and who have caused the U.S. such irritation ever since. The U.S. has since undermined or overthrown a string of other democratically elected governments, including Indonesia (1965), Chile (1973), and Nicaragua (1990). Its attempt to promote the overthrow of the Chavez Government of Venezuela in 2002 flopped due to popular support for Hugo Chavez. In all cases, the democracies were replaced by repressive and usually corrupt governments with power bases among the wealthy elites. The Chilean dictator Augusto Pinochet is among the most notorious for his reign of terror, involving torture, murder and “disappearances”, from 1973 until a popular uprising ousted him in 1990. 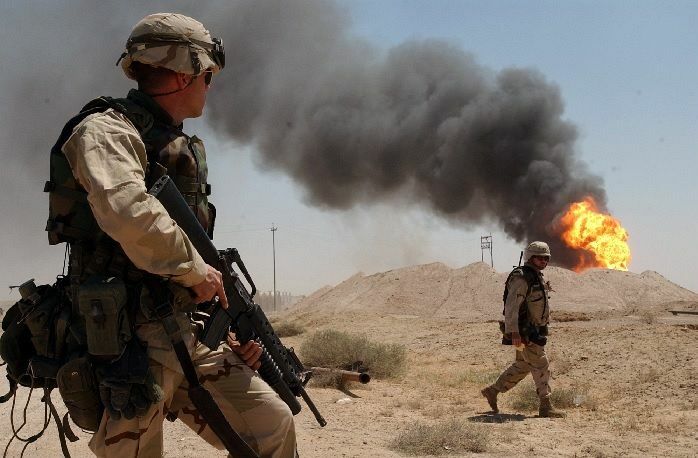 The U.S. also backed and armed the brutal regime of Saddam Hussein in Iraq, until he over-reached and invaded Kuwait, triggering the first Gulf War. Iraq played no role in the 2001 attack on New York’s World Trade Centre, but President George W. Bush used the attack as an excuse to invade Iraq, which was allegedly harbouring Al Qaeda groups. Somewhere between 100,000 and 500,000 civilians are reported to have died as a result of the invasion and subsequent fighting, effectively retribution for the 3,000 who died in the WTC attack. The I.S. group is certainly brutal and extremist, but would the U.S. be taking any interest if its access to a strategically important resource was not being threatened? Evidently, human rights abuses are ignored unless they conveniently align with reasons considered more compelling to American interests. The public beheading of Westerners is clearly intended as a provocation. Sure enough, it is provoking widespread outrage that, more than anything, perhaps, is fuelling uncritical calls for intervention. That is exactly the response I.S. wants, as it will incite more locals to their kind of extremism and unite reluctant locals against the outside threat. In any case, Saudi Arabia beheads people on a weekly basis, but that evidently is of little interest, so long as no Westerners are involved. The consistent factor in U.S. policy clearly is to defend or enhance U.S. “interests” — which means, in practice, the commercial interests of U.S. business. Oil underpins all the other interests. This is not a recent feature of US foreign policy. Howard Zinn, in his classic A People’s History of the United States, concludes that U.S. presidents have always allowed their foreign policy to be bounded by the interests of the country’s rich and powerful. So a century of Western meddling has generated progressively more resentment and more extreme responses in the Middle East. Violence begets violence and the I.S. and the U.S. are merely embarking on yet another turn in the cycle of violence. Why is this apparently so beyond the critical faculties of what passes for Australia’s political conversation? The solution ‒ not easy, but clearly available ‒ is to desist from further military intervention. There will, unfortunately, continue to be violence within the Middle East, but the defensible course is to try, by nonviolent means, to reduce the violence as much as possible. Intelligence analyst Chelsea (formerly Bradley) Manning argues for the viability of such an approach. Of course, there is the possibility that Western access to oil will become more difficult or more expensive if I.S. continues to take over more territory, though in the medium term it is more likely to stall and fragment, in the absence of external intervention. The irony is obvious to many of the commenters, understanding the threat starts with those three. It is the continuing follies of U.S. policy and our involvement in them, that make us a potential target for domestic terrorism — not some bogus perceived external threat. Dr Geoff Davies is an author, commentator and scientist. He is a retired geophysicist at the Australian National University and the author of Sack the Economists (Nov 2013). He blogs at BetterNature.